Starting today, the new pass will allow guests to enjoy 12 months of never-ending magic at Shanghai Disneyland! Shanghai, January 25, 2019 – Shanghai Disney Resort today announced the launch of the first-ever Shanghai Disneyland Annual Pass. Officially available beginning January 25, the brand-new Annual Pass provides incredible value for guests, giving them the opportunity to enjoy a full 12 months of magic at Shanghai Disneyland with family and friends – from year-round themed celebrations with exciting entertainment and festive decorations, to unique merchandise and memorable dining options. When can guests purchase the Shanghai Disneyland Annual Pass? The new Shanghai Disneyland Annual Pass is available for guests to purchase and redeem from January 25, 2019. Guests can purchase the Shanghai Disneyland Annual Pass on multiple official resort channels, including the Shanghai Disney Resort official WeChat account, the Shanghai Disney Resort official WeChat Annual Pass Mini Program “E-gifting Annual Pass” (Chinese language only), the Shanghai Disneyland Main Entrance ticket booths, and the Shanghai Disney Resort Reservation Center at 400-180-0000 or +86-21-3158-0000. From February 15, 2019, guests can also purchase the Shanghai Disneyland Annual Pass via the Shanghai Disney Resort official website and app. How much does the Annual Pass cost? We offer a Sunday Annual Pass, a Weekday + Sunday Annual Pass and an Anyday Annual Pass, each available at a different price. Children, seniors and disabled guests can purchase passes at reduced rates. *The prices above are subject to change from time to time. 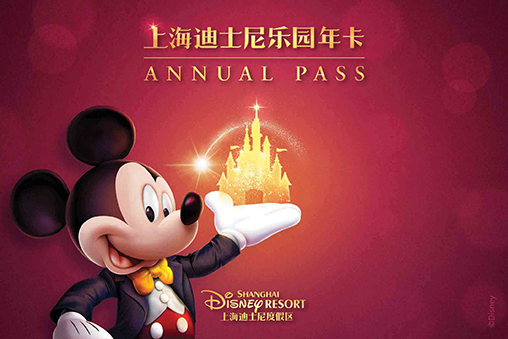 What does the Shanghai Disneyland Annual Pass include? Guests will have visibility for at least three months of the pass calendar (including the current month). The pass calendar for a new month will be released in the middle of each month. * Please visit the Shanghai Disney Resort official website for the full list of special benefits and user Terms & Conditions. What’s the validity period of the Shanghai Disneyland Annual Pass? The Shanghai Disneyland Annual Pass is valid for 365 days, which will be calculated from 15 days after the date-of-purchase. The validity period of the pass will not be impacted by the redemption date of the pass or the guest’s first entry date to the park using their new Annual Pass. Shanghai Disneyland Annual Pass holders can visit Shanghai Disneyland from the date of purchase once they have redeemed their Annual Pass successfully, but the access to the park will still be subject to the Annual Pass calendar. Guests are advised to redeem their Annual Pass at the Shanghai Disneyland Main Entrance ticket booths and Guest Services Center within 15 days of the date of purchase. Any Annual Passes not redeemed during this time will be automatically activated. access. 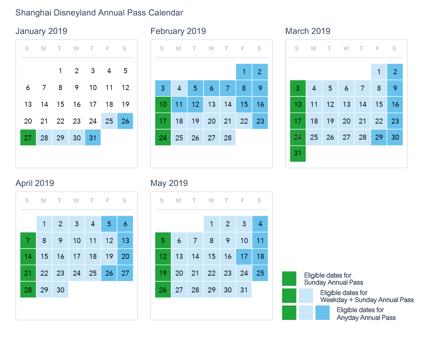 If the guest doesn’t redeem the Annual Pass before February 9, 2019, the Annual Pass will be automatically activated on February 9, 2019 regardless of the guest’s actual first entry to the park, and expire on February 8, 2020. Is a government ID required to purchase an Annual Pass? Yes, a government ID is required at the time of purchase. Chinese Mainland guests must provide their PRC Resident ID Card. Hong Kong and Macao guests must provide their Mainland Travel Permit for Hong Kong and Macao Residents or PRC Travel Document. Taiwan guests must provide their Mainland Travel Permit for Taiwan Residents or PRC Travel Document. Other guests must provide a valid foreign passport. However, the guest who purchases the Annual Pass does not have to be the Annual Pass holder or user. The Annual Pass will be associated with the identity and photo of its user upon redemption and is non-transferrable after that. A guest can only own one Annual Pass in his/her name during the pass validity period. How do guests receive their Annual Pass? Starting January 25, 2019, guests who have already purchased a Shanghai Disneyland Annual Pass should proceed to the theme park’s Main Entrance ticket booths and Guest Services Center. Guests will have their photo taken and have their pass issued at that time. Guests will use the same pass for their first visit and for subsequent visits and their photo on file will be used for validation. What are the restrictions on the Annual Pass? The Shanghai Disneyland Anyday Annual Pass grants guests park access on any day during the pass validity period; the Weekday + Sunday Annual Pass offers a minimum of 250 days of park access during the pass validity period, including most weekdays, Sundays, and part of the summer and winter holidays; and the Sunday Annual Pass allows pass holders to visit the park on most Sundays, ensuring a minimum of 45 days of park access during the pass validity period. Admission is subject to available park capacity each day. The Annual Pass does not give access to the park during special events that require a separate admission charge nor does it give free access to the parking lot, or the Walt Disney Grand Theatre. Can guests change the name on their Annual Pass? The Annual Pass will be associated with the identity and photo of its user upon redemption and is non-transferrable after that. Only the guest whose name appears on the pass and whose picture is associated with the pass may use it for park entry. Guests should always bring their government ID to the park with them each time they use the pass, as their government ID will be requested by our Cast Members at the turnstiles to confirm their identity. Guests can contact the Shanghai Disney Resort Reservation Center at 400-180-0000 or +86-21-3158-0000.